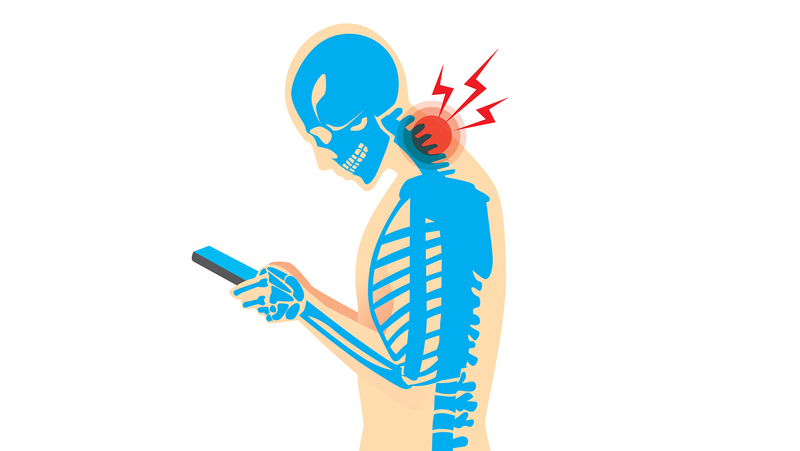 Text neck Syndrome is a Modern age term coined to describe the iterative stress injury and pain in the neck resulting from excessive watching or texting on hand held devices over a prolonged period of time. It is also often known as Turtle Neck posture. It is a cause for increasing concern especially with children given their greater inclination and susceptibility to mobile phone usage. Recent figures have shown that around 87% of teenagers (14-18 years) in USA and 79% teenagers (12-15 years) in UK own and use smartphones. Among adults 92% and 95% (18-34 years) reported owing a smartphone in USA and Australia respectively. Is Text Neck Really an issue? You’ve probably been staring at your device for years and haven’t noticed any issues. That is why it is important to understand the insidious nature of this syndrome. Its effects are subtle but progressive. Hence, it is really imperative to tackle this problem eventually. Text Neck has been linked to headaches, neurological issues, depression, and heart disease. • The prolonged disposition and exposure of one to electronic devices is the fundamental cause of Text neck. • When holding your head in a forward and downward position, excessive amounts of tension is created in the deep muscles of your neck and across the shoulders causing both acute and chronic neck pain. • The average weight of a human head is 10-13 pounds. When the head is bent at an angle, it causes your spine to work harder to hold the head up. This shifts your head out of the centre of gravity of your body, causing it to feel considerably heavier and causes increased stress on your cervical spine or neck. • Stiff neck: Soreness and difficulty in moving the neck is usually present when trying to move the neck after long usages. • Chronic headache: The tightness or stiffness of the muscles can lead to persistent headaches. • If a cervical nerve becomes pinched or strained, pain and possibly neurological symptoms can radiate down your arm and into your hand (known as cervical radiculopathy). • Chronic problems may also occur due to early onset of arthritis in the neck. • Hold your phone higher: Raise the phone up to the level of your eyes so that your head does not have to be tilted or bent forward. • Take frequent breaks: Spend some time away from the phone or any type of head-forward posture. If needed, use an alarm or app to set automatic reminders to take breaks from handheld devices. 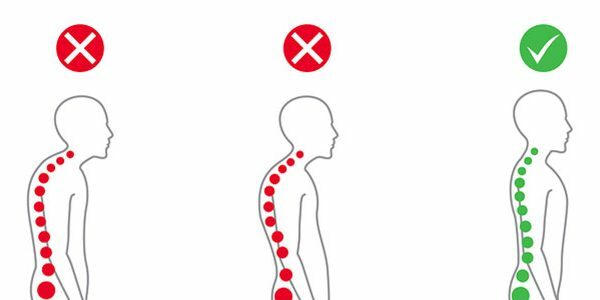 • Stand up straight: Maintain a good posture with your head up high straight and shoulder tucked backwards in order to achieve the correct position to help release strain and relax your body. • Exercise regularly: Working out or playing sports on a daily basis helps one maintain a healthy and fit body and on the other hand also helps to regulate the body metabolism. • Physical therapy program: A physical therapist or other health care professional can design a stretching and strengthening program for the patient’s specific needs. This program is typically performed at a clinic, at least initially, to ensure that the stretches and exercises are performed in an effective and safe manner. In today’s world where life is developing and moving forward at such an immense pace we humans have become ignorant and reluctant towards a lot of vital aspects of our lives, our health being among one of them. It is believed that good health and good sense are two of life’s greatest blessings. So as sentient beings it is our righteous duty towards selves to shield and maintain this valuable asset of ours.It takes just a little bit of mindfulness and efforts to manage these symptoms and this condition. These symptoms can creep up on you slowly, but chances of a negative impact on your health increase each time you hunch or bend on your phone. Therefore, we should acknowledge, expand and strengthen our insight on the shortcomings of the so considered “Boons” and prepare and fortify ourselves to tackle these issues to lead a wholesome and content life because once your inner world comes into order your outer world automatically follows suit.